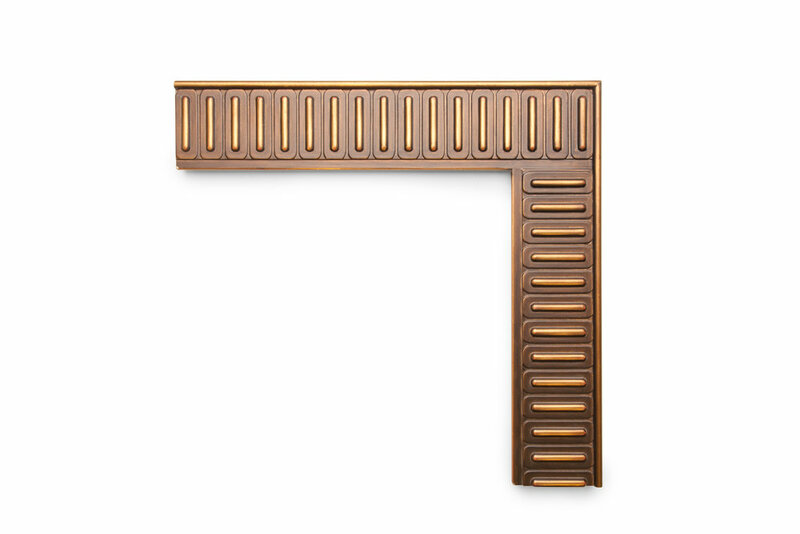 4” Gold Ribs with Bronze Background Geometrical arts and crafts profile perfect for linear design, cityscapes and modern abstract artwork. 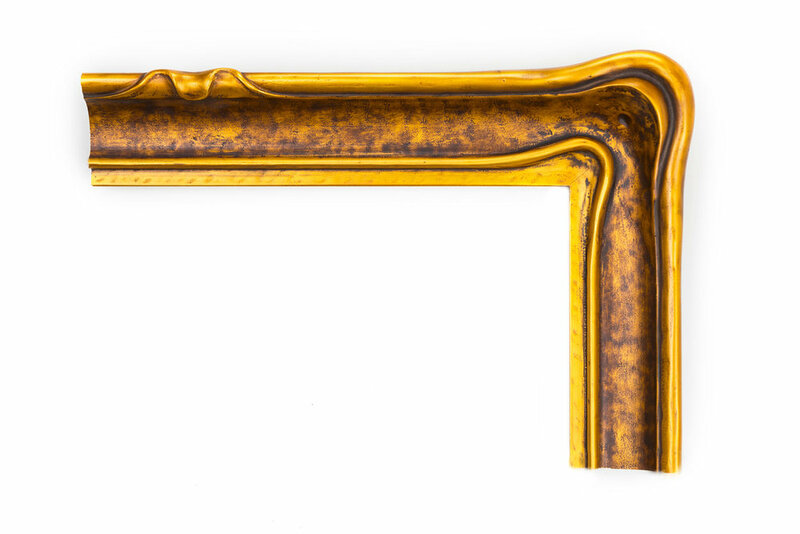 An American 4 inch Impressionist-era frame, with a textured scoop panel and notched corner decoration. The finish shown is matte lemon gold with a purple clay. An American 2-1/2 inch Foster Brothers-style frame, this ornate profile features Dutch-style craft corners, heavy reeding along the inner sections, and overlaid tulip flower decoration along the outer edges. The finish shown is a matte yellow gold with antiquing and a blue clay. An American 3 inch Impressionist-style frame, the elaborate carving alternates between sweeping curves and sharp angles. The finish shown is 22k yellow gold with an antique finish and faux dust. 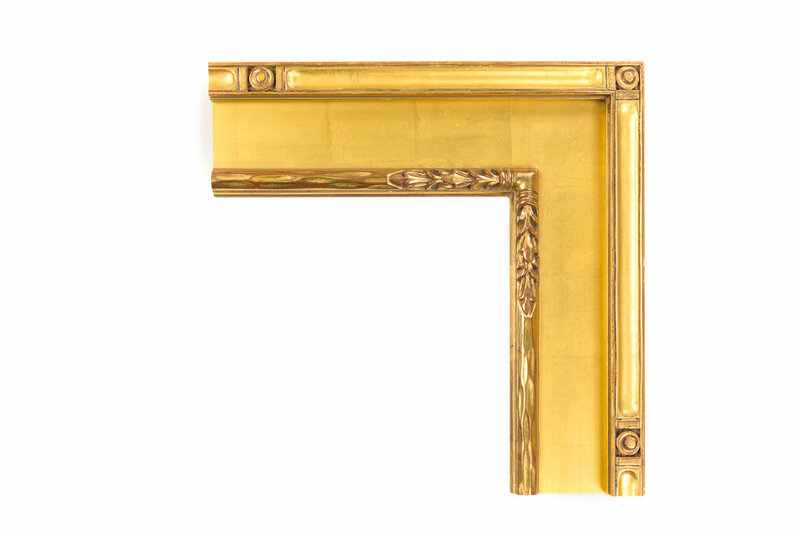 An American 1-1/2 inch Empire-style frame, with long interrupted-bead decoration throughout, leading to a chisel-carved corner. The finish shown is yellow gold with a red clay. An American 4 inch Whistler-style frame, with three individual flat panels of basket-weave pattern punchwork. The finish shown is matte lemon gold with a purple clay, and can be customized. 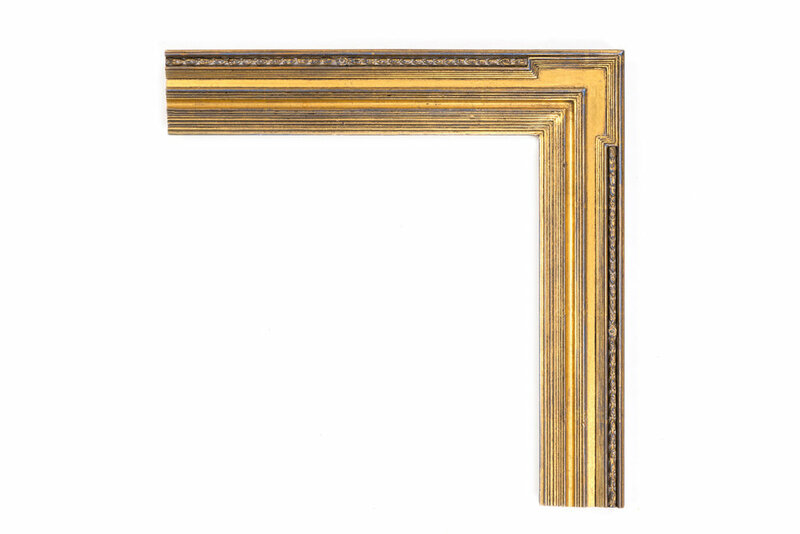 An American 3 inch 20th-century frame, with combed carving throughout and softly rounded outer corners. The finish shown is 18k pale gold with an antique finish and black clay. 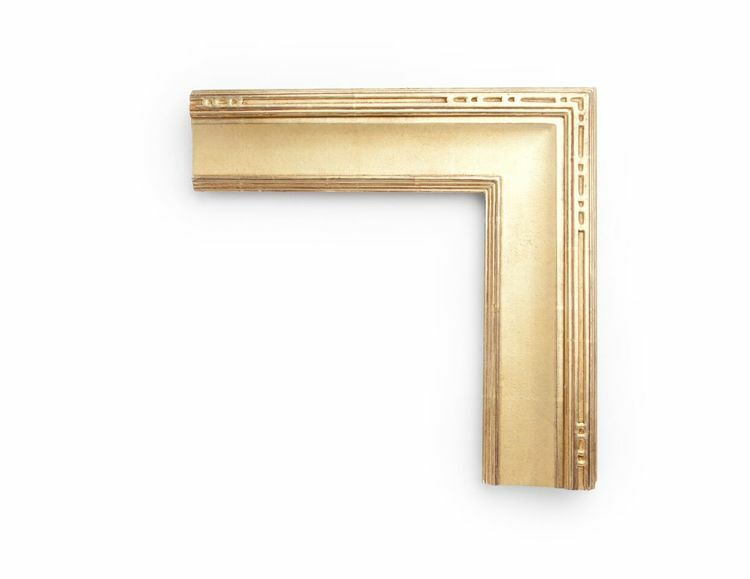 An American 2-1/4 inch Impressionist-era Murphy-style frame, this cassetta profile features a cut-out scoop and corner decoration on the outer rail, flat center panel, and inner overlaid tulip decoration. The finish shown is yellow gold with an antique finish and a red clay. An American 1-1/2 inch American Indian-inspired style, the raised inner lip has triangular carved and bored elements. The finish shown is a 22k matte panel & burnished lip yellow gold with faux dust. 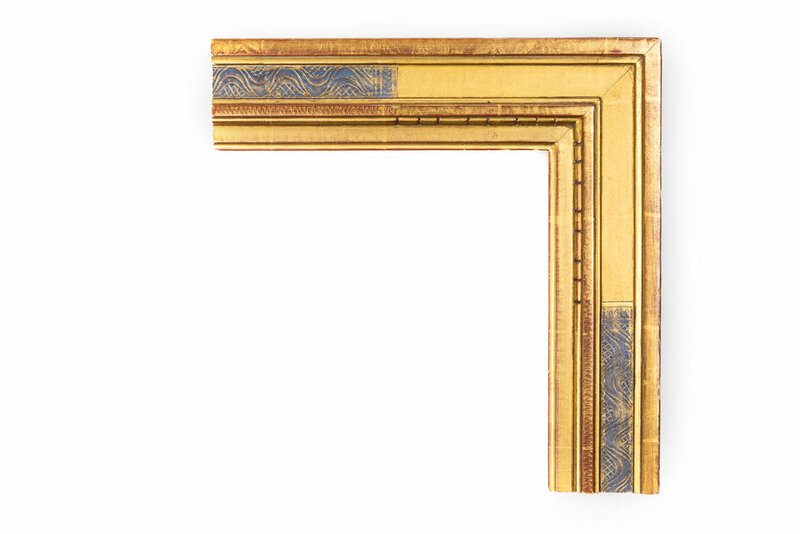 An American 4 inch Frederick Harer-style frame, this cassetta profile features a geometric diamond pattern on the panel at the corners, with a heavy rub revealing the colored clay beneath, as well dental carving and a zigzag pattern on the inner rail. The finish shown is yellow gold with red-and-black clay. 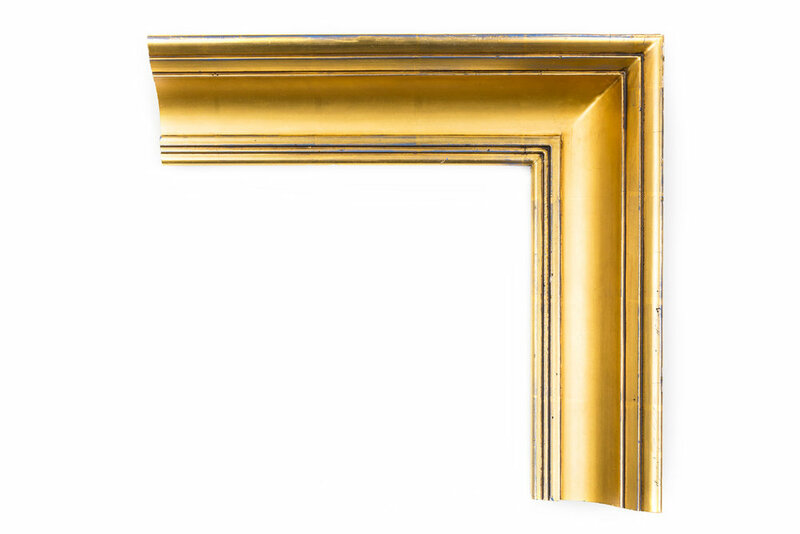 An American 2-1/4 inch Federal-style frame, with a simple and unadorned deep center cove and a round bead at the front. The finish shown is yellow gold with a blue clay. An American 2-3/4 inch Stanford White-style frame, with a reeded inner lip, repeating acanthus leaf decorations throughout, and a leaf corner decoration. The finish shown is yellow gold with an antique finish and red-and-black clay. This is a small sample of our selection of American frames. Come in to see more.